The Royal Horticultural Society’s Chelsea Flower Show is well known as the world’s most famous floral spectacle. For more than 80 years this celebrated show has blossomed in the centre of London. A floral feast for the senses, this show brings you innovation and creativity from leading garden designers and nurseries. We also feature historic Windsor and a visit to Oxford. Friday 24th: Depart in the morning travelling to Windsor for time at leisure. This afternoon we make our way to the Hilton St Annes Manor Hotel. Saturday 25th: We leave our hotel after breakfast and head for London and the Chelsea Flower Show. See the grounds at the Royal Hospital Chelsea transformed with stunning horticultural displays for the prestigious RHS Chelsea Flower Show. Stroll through showstopping and award-winning gardens, discover rare flowers and plants and creative floral artworks. Spot emerging gardening trends and browse the horticultural products on sale, from gardening gadgets to sculptures and plants. As always, there will be plenty of opportunities to catch the latest trends and designs in flora and fauna. 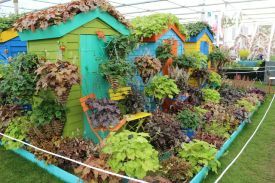 If you have a gardening problem, don't fret, as there will be plenty of experts on hand providing helpful tips and advice to inspire your gardens back home. We leave Chelsea late afternoon and return to our hotel for dinner. Sunday 26th: After breakfast we leave for the Thames Valley, calling in at Henley-on-Thames before continuing through Wallingford to Oxford, City of Dreaming Spires. We have time to obtain lunch and explore the city with its many magnificent university buildings before leaving during the afternoon for home. The Hilton St Annes Manor Hotel is a country house hotel set in 25 acres of grounds. The Omnia Restaurant is located in the elegant Victorian manor house. It offers modern cuisine and classic British dishes. The LivingWell Gym is open 24 hours and massage and beauty treatments are also available.